Oklahoma Alligator Gar Record - Crushed! About 1 p.m. April 23, 2015, angler Paul Easley of Mead, Okla., was snagging in Lake Texoma in Marshall County when he landed a new state-record alligator gar. The monster fish was 97 3/4 inches in length, 44 inches in girth and weighed 254 pounds, 12 ounces. Easley was using a Quantum reel on an Eagle Claw rod with 150-pound braided line. The gar was weighed on certified scales at the Wildlife Department's South Central Region fisheries office near Durant, and then released alive. 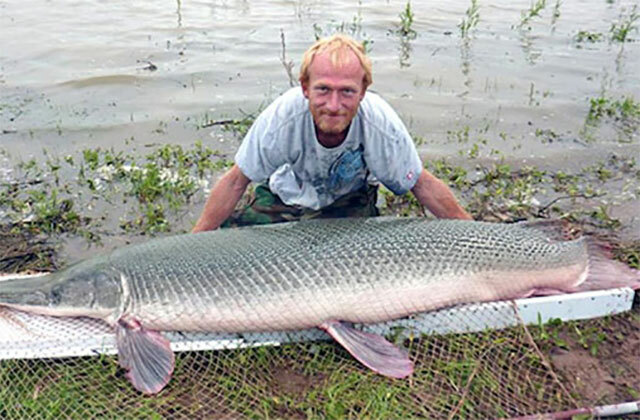 The previous state-record alligator gar weighed 192 pounds 1 ounce, caught in January 2011 in the Red River.